Apple Senior Systems Engineer J.D. 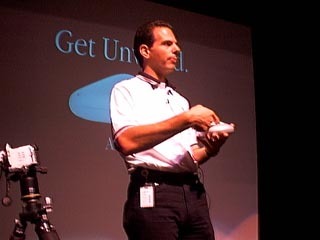 Mankovsky, one of the most enthusiastic and knowledgeable people ever to click a mouse, brought the new iBook to Washington Apple Pi in August. 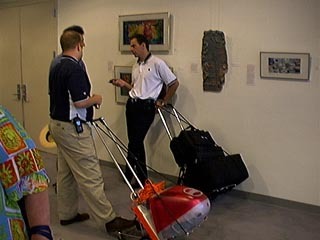 He also brought a large collection of USB and FireWire peripherals, two PowerBooks, a digital camera, and some great wireless networking equipment. lots and lots of other stuff, some of which he said we shouldn't mention, or even mention not mentioning. 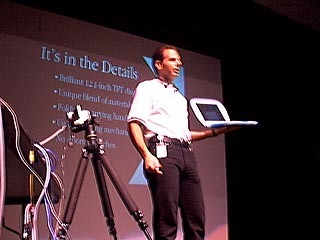 JD shows the iBook closed, noting there is no latch, and the edges are covered with an impact-absorbing rubber. 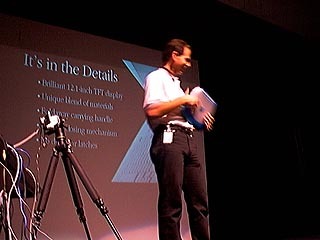 JD shows the iBook open, noting the "instant on" feature, and recalling another Apple portable, the eMate, with a similar talent. JD shows off the AirPort base station. (Actually, this was an empty shell, as the AirPort had not received FCC approval at the time of the meeting.) The AirPort base station looks very much like a flying saucer, so, naturally, JD showed a forthcoming commercial which takes advantage of this similarity. 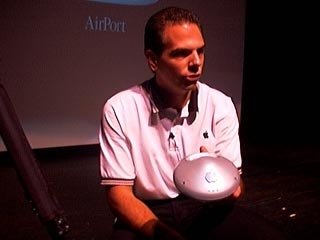 While JD didn't say a thing on the subject, the following week Steve Jobs announced the Power Mac G4. Some versions of the G4 will be able to act as a base station. This is a good thing to keep in mind when you talk to your spouse: "But if I get a G4, we won't have to buy a $299 base station for the iBook!" "And now, for my next trick..." The most involved demo required almost every piece of wizardry available: using streaming QuickTime 4, a video capture card, a digital video camera, two PowerBooks and an iBook, he displayed a semi-live (seven second delay) video image of the crowd, captured on digital camera and streamed via QuickTime streaming, which was captured on a video capture card and transmitted for viewing on the iBook's screen. Follow all that? 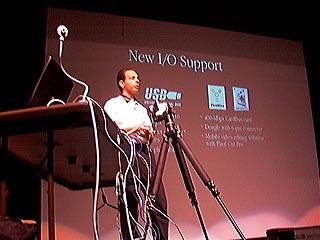 Realizing that a large auditorium is not the best way to see semi-live streaming QuickTime on an iBook screen, JD wandered the aisles of the auditorium. 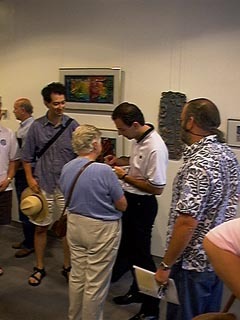 He politely ignored repeated invitations to leave the iBook behind, or to give it away in the end of meeting drawing. Skeptics waved their hands every now and then, to see if the image really was semi-live. 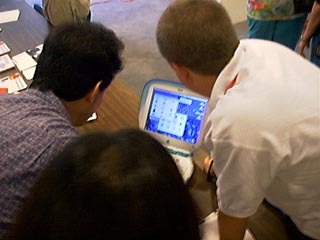 Enthusiasts plotted how to buy an iBook or twelve. Fanatics plotted how to buy one of everything shown or demonstrated. 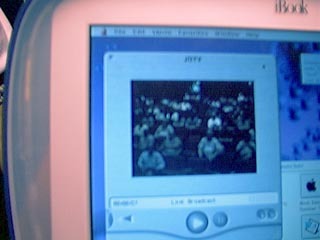 After the main presentation, the crowd retired to the foyer and attempted to set a new world record for how many people could view an iBook at once. 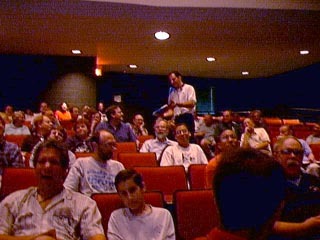 (Lots of people didn't see the iBook because they didn't come to the meeting. The Webmaster, in fact, received quite a bit of E-mail complaining that there "were no pictures" of the iBook up on the site yet. Transportable technology: one baggage tote holds a strawberry iMac. The other holds two PowerBooks, an iBook, a digital camera, and lots of other stuff.